In addition to being able to edit a member's Contact Info, Photo, and Preferences, administrators can change Users' Permissions, and Digest Subscriptions. 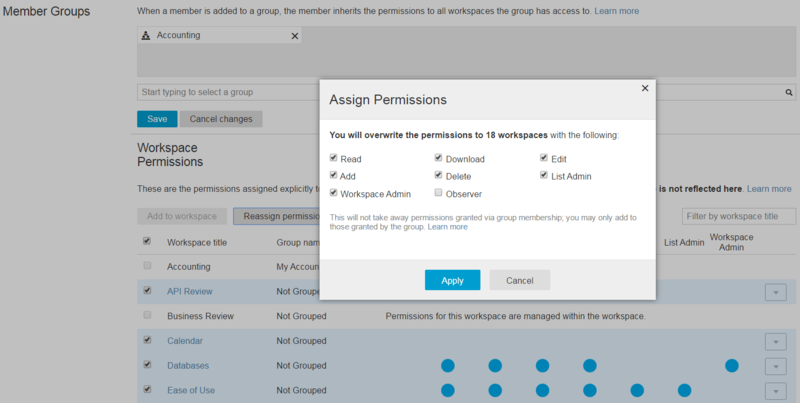 The Permissions tab, (below), displays any Groups the user belongs to, as well as a grid view of permissions for all company workspaces. User permissions can be changed here without having to go to any workspace. Administrators will not be able to add a photo for members who have not yet accepted the invitation to the organization or workspace.